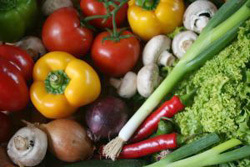 green beans | What's Cooking at the Genua's? For Thanksgiving we are going to a friend’s house and when I asked what I could bring, I was asked: “How about that green bean casserole thingy? Thanksgiving wouldn’t be complete without it!” I said ok and searched for the usual recipe. Growing up in my house was very different when it came to Thanksgiving. Why? Well it wasn’t until we were all much older that we started to actually have a turkey for the Thanksgiving dinner. I’m not joking. I never really remember Dad carving a turkey. Ever. I do remember us having a huge tray of lasagna though. Every year. And sometimes a ham. But never a turkey. It was usually lasagna. When we started dating and then had to do the two house thing for the holidays we all discovered how different things were out there! Nobody had lasagna! I was flabbergasted! I don’t know why we didn’t have turkey, maybe Dad hated carving? I don’t know. 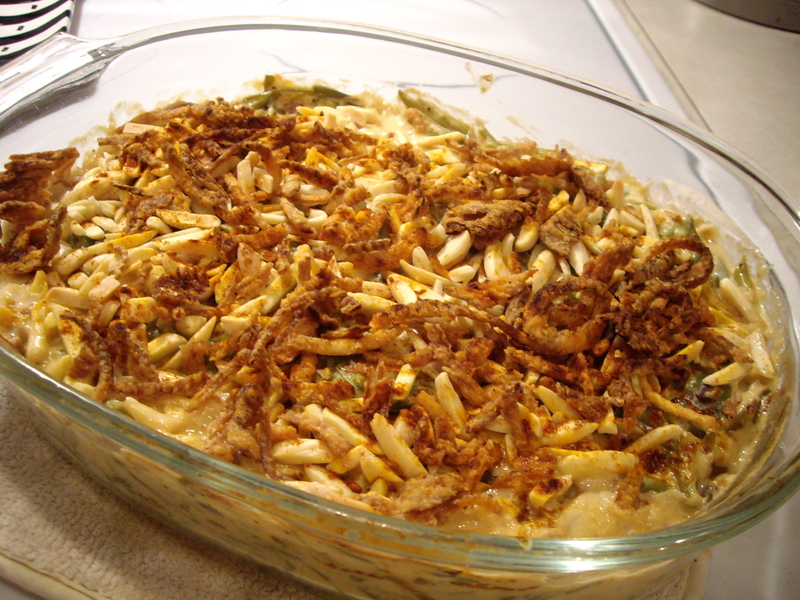 But once we started experiencing the ‘normal’ Thanksgiving foods I was introduced to the green bean casserole. And for some reason it is rarely served any other time of year! Why? Again, I don’t know. So of course I have never made it before. This is a first. 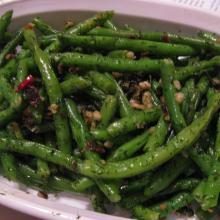 But I also didn’t want to do the same ho-hum basic green bean casserole. So I scoured the magazines and internet. I then took a little bit of each recipe that I found and it’s now something new. I am making it Thursday so I won’t know how it tastes until then. I will report back though for sure. And I will remember to take a picture before we eat it! And have no fear everyone, I’m still using those french-fried onions. My husband insisted on it. I have to keep remembering, change is good. It will be fine. Thanksgiving will still be a food fest. Happy Eating! 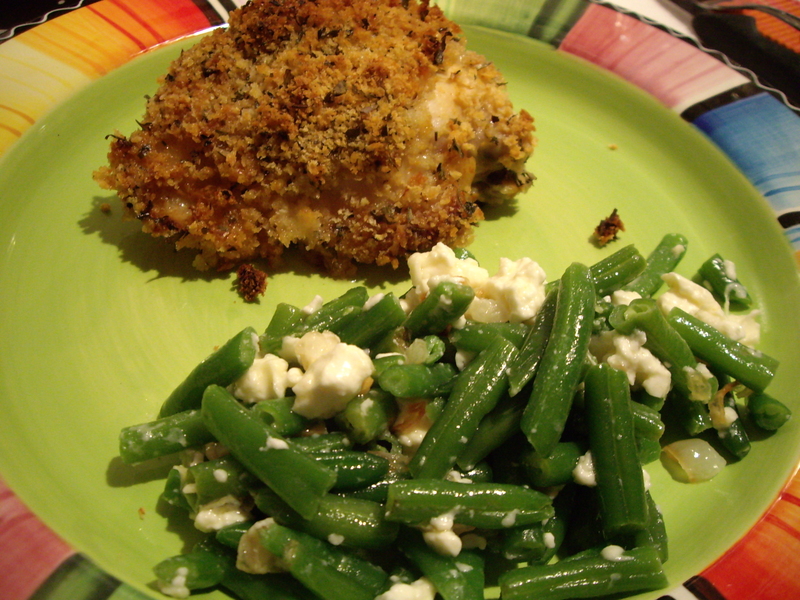 **Ok, the green beans were a hit! Very tasty and full of crunchy goodness! The water chestnuts and almonds are a nice change from the ordinary. I also lowered the oven temp to 350 degrees, because the onions got a little too well done, but still really yummy! I’m also thinking next time maybe a little hot sauce added to it would be good also. 1. Cook green beans according to package directions, drain. 2. In a large pot or dutch oven melt the butter. Add the soup and cream cheese and cook over low heat, stirring constantly until cream cheese is melted and mixture is smooth. Remove from the heat. 3. 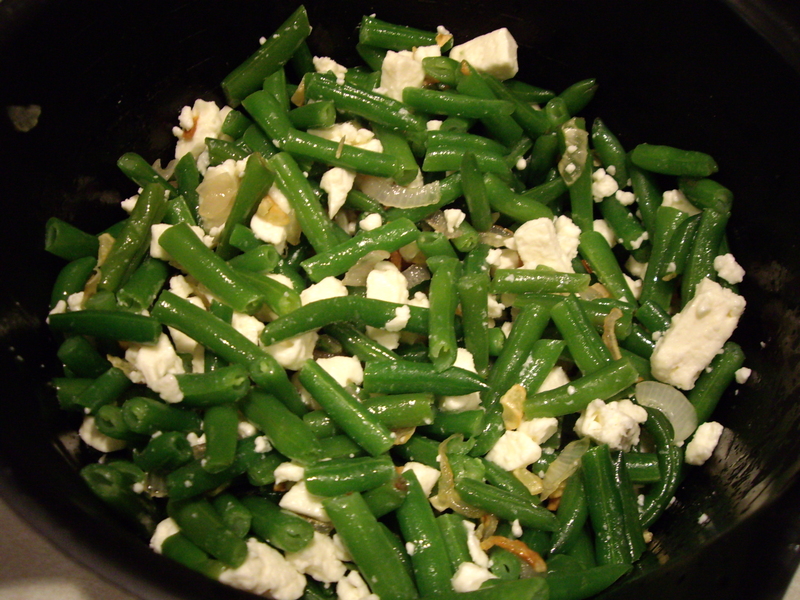 Stir in the green beans, 2/3 cup of the french-fried onions, water chestnuts, garlic salt, pepper, and cheddar cheese. 4. 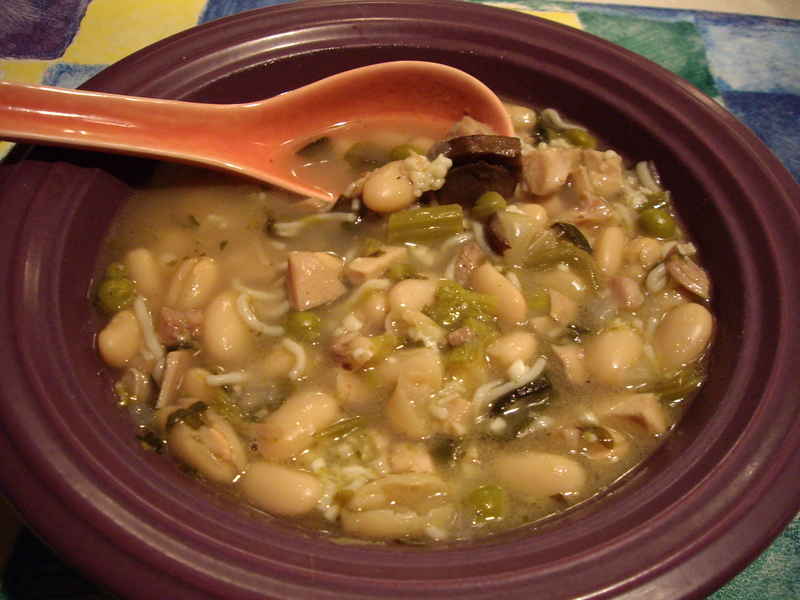 Spoon the mixture into a lightly greased 1¾ quart casserole dish. 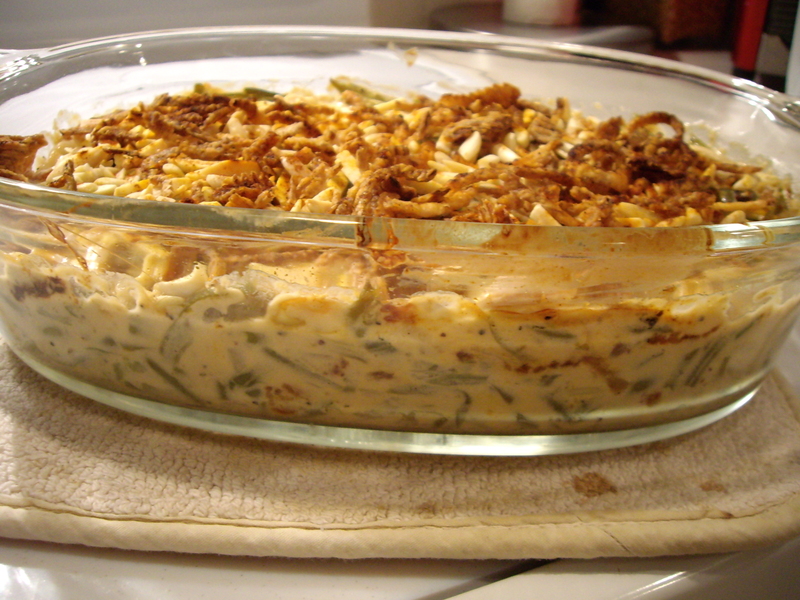 Top with the almonds and remaining french-fried onions. Sprinkle with paprika. 5. 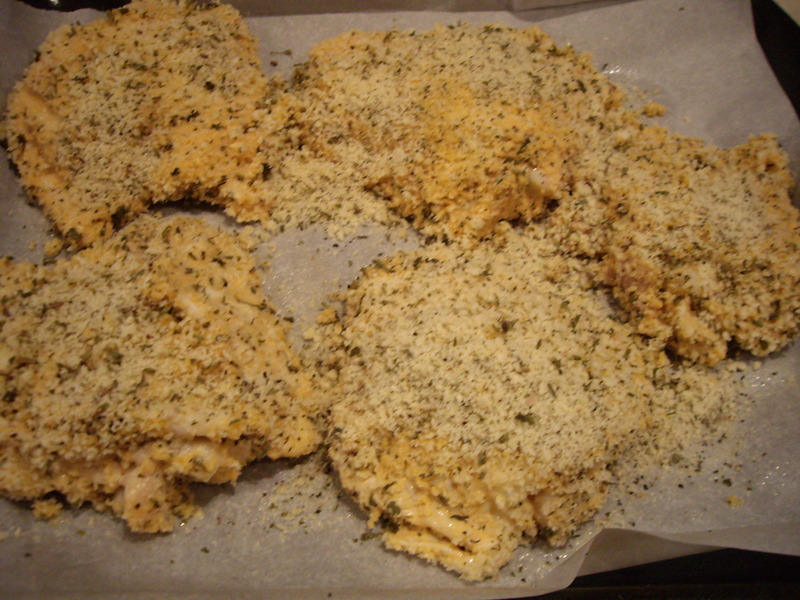 Bake at 350º, uncovered, for 45 minutes.